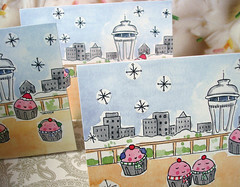 Cake Byte: Sweet Cupcakes at the Space Needle Holiday Cards! 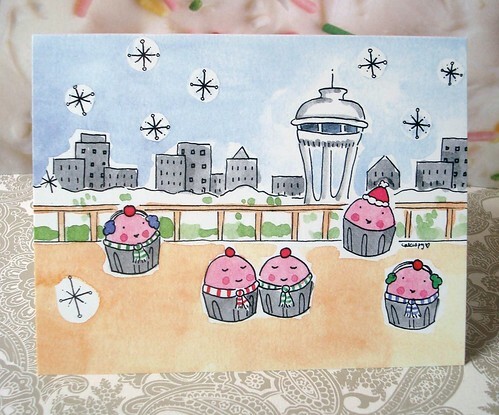 Here's a shout-out to all of the Seattle sweeties out there: a bonus Cupcakes at the Space Needle holiday card design! It's the newest item in the CakeSpyShop. This is a boxed set of 10 cards and envelopes. The cards measure 4.25 x 5.5 inches folded. All ten are the same design: sweet little wintry cupcakes at the Space Needle in Seattle! The envelopes are plain white, and empty canvas to draw little snowflakes, hearts and Santa hats on for the recipient! 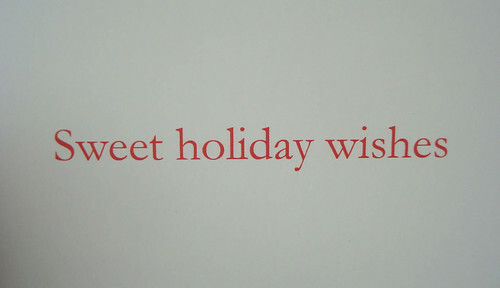 Inner Greeting: "Sweet holiday wishes"
These cards (as well as a bunch of other sweet stuff for the holidays!) are available for purchase at CakeSpyShop.com.